That's a long time ago, and a lot of water under the cultural bridge, but it still illustrates a lot the massage that actually happens in the world. 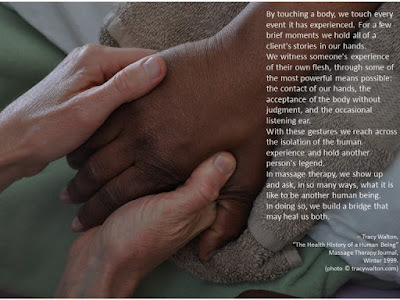 We like to talk about massage as medical treatment or as cosmic connection, but much of it is just "where's my rubdown?" There's a directness and lack of pretension to it. I have a few clients who think of it this way, and I like working with them. I relax them, soften things up, work out the kinks a bit, and I'm on my way. I have a client who just had his 95th birthday, who listens to Glen Miller during the session -- the music of his youth, as I might listen to Crosby Stills & Nash -- and at the end he'll say, "that felt good!" and we're done. In chatty mood, we might discuss single-payer insurance (I'm fur it, he's agin it) or rent control (we both take a dim view of it.) I'm not expected to fix anything or deliver any insight. I have younger clients who treat it the same way. One professional woman who works at her laptop the whole time I'm setting up, hops on to the table for her 90 minute massage, hops back off, and is back at work again before I'm all packed up. We exchange a few pleasant words about her last business trip, maybe, but my job is to deliver the rubdown. It's an uncomplicated, straightforward service relationship. If massage was my first career, rather than my third, it might rankle a bit -- being the help -- but I'm long past all that. I don't mind being a servant, as long as I'm treated well. It's comfortable. Soothing. The text for my ethics class in massage school, made much of the the care massage therapists must take with the power imbalance of the therapeutic relationship: we were the experts, the authorities, and our timid clients would believe anything we said and follow any instructions we gave. Well, yeah, sometimes. Sometimes not. She decided she could, that she did. But in mulling it over, and thinking about what massage as a business and a medical intervention has become, she wonders: is this what we wanted? Is this really what we were trying to create? Reading Tracy's post made me wonder something more immediate and more personal: how well have I kept my own practice aligned with what I am trying to do in the world? How hard have I even tried? And have I ever really thought it out? The anxiety of "can I actually make this work?" 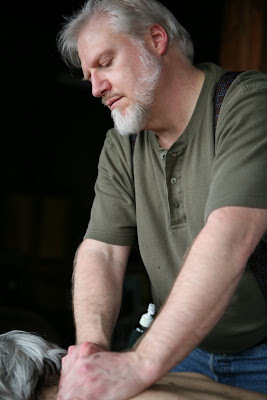 and the day to day business of getting a practice off the ground have carried me along -- in my case, for twelve years. The work itself is absorbing and joyful. My practice is a personal and practical success. But what am I succeeding at? I wanted to be my own master, choose my own hours, make my own rules: and my life has been much happier and calmer since I achieved that. I also wanted a life that encouraged -- demanded -- a daily cultivation of compassion. I wanted, in Tracy's words, "to build a bridge that may heal us both." Have I done that? Well, in some ways. This is where the larger context of massage as business, massage as medical intervention, comes into play. I don't actually get to set my own rules (nobody does.) Whatever I do, I'm working with my clients' expectations, and I'm working within the laws and customs governing massage here in my corner of the world. By local expectation, law, and custom, massage is a business, selling a personal service, as a hairdresser does; and it's a medical intervention, treating musculoskeletal ills, as a chiropractor does. And then (not by law, but by alternative custom) it's sometimes a third thing: a healing ritual, addressing spiritual ills, as a shaman does. In any given day I might have clients who think of a massage primarily as any or all of these. I'm an affable man and I try to deliver what's expected. But what do I think it is? What do I want it to be? I'm going to think about that for a while. I don't have a simple answer.